Legislation and formal procedures are required to ensure the effective participation of patients and patient groups in health technology assessment processes. A new report from the Patient Voice Initiative has delivered a number of recommendations following a series of meetings, workshops and conferences. The initiative was formally launched in 2016 by a cross-section of stakeholders, including patients, patient groups, industry and academia. Its goal is to grow the presence of the patient voice in the health technology assessment processes underpinning advisory bodies like the Pharmaceutical Benefits Advisory Committee, Medical Services Advisory Committee and Prostheses List Advisory Committee. 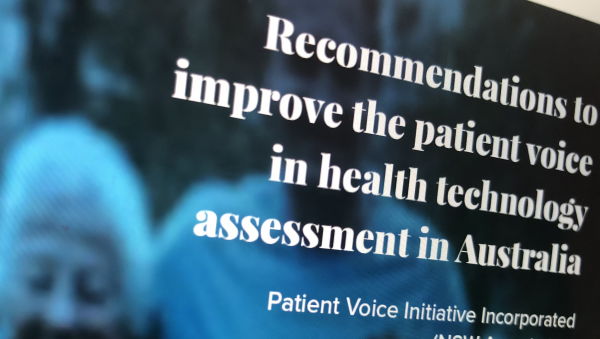 It has held events in a number of cities across Australia leading to the release of a new report - Recommendations to improve the patient voice in health technology assessment in Australia. The report makes four key conclusions. In addition to legislation and formal procedures to ensure the participation of patients and patient groups that take part in health technology assessment processes, it recommends the creation of a unit to support and develop patient involvement, further training and guidance for patients and patient groups, and the development of tools that support an evidentiary basis for the patient perspective. According to Patient Voice Initiative chair, Jessica Bean, “Globally there is strong acknowledgement of the need and value of involving patients in healthcare decision-making. However, the challenge remains - how to best facilitate involvement that captures and values patient expertise in a robust, dynamic, and systematic way, while still offering timely access to treatments and therapies. “There has been resounding agreement of the need for enhanced patient involvement to ensure the Australian healthcare system meets the needs, values, and expectations of those who most depend on it As a patient waiting for guaranteed access to a new therapy, I know just how important and needed this work is. “This report makes a number of practical recommendations which we are keen to see the Government adopt including providing for earlier engagement of patients in the medicine reimbursement process, and a standardised and systematic approach to capturing and interpreting evidence that is relevant to patients in the decision-making process for the funding. Ms Bean said the initiative will hold a series of workshops for patients and patient groups in late October and November 2018 in Sydney, Adelaide and Perth. PBAC deputy chair and consumer representative, Jo Watson, will be involved in the workshops.